New Network Upfronts! Are you Ready!?!? It’s my pleasure to announce that Threat Quality TV has been contracted to produce five new television shows, which will premiere this coming fall on…oh, let’s say CBS. Are you excited for the new CBS schedule? You will be! What if being a nerd, instead of making you a pathetic loser, actually just meant that you were really good at something useful? When 16-year-od James Quirk (Jesse Eisenberg) sees his parents murdered, he takes refuge in an unlikely source: Batman comics. After years reading so dedicated that it borders on worship, Quirk has fashioned himself into the detective of his fantasy. He now works as a consulting detective for the Philadelphia Police Department, along with his friends – Paolo (Lin-Manuel Miranda), a socially-awkward, Ivy-League graduate with a background in everything, and Violet (Gugu Mbatha-Raw), a steampunk-hacker-engineer – solving crimes and trying to track down his parents’ killer. Where science goes just a little crazy. When Jenny Sever (Jena Malone) is finally released from the mental institution where she’s been for her last two years of high school, she thinks her future is essentially ruined: she never finished high school, has no chance for college, and still suffers from occasionally bouts of mad hallucinations. But then she’s approached by an enigmatic man named Zedidiah Waite (Fran Kranz) and given an opportunity to attend the uniquely eldritch Miskatonic University– a school that pushes the bounds of science beyond any ordinary human reason. We’re fighting for more than just the world. It’s the middle of the Second World War, and it’s become apparent to British Intelligence director William Stephenson (Anthony Stewart Head) that the Fuhrer is after more than just territory: he’s commissioned a secret team to scour the world for mystical, religious, and possibly dangerous artifacts in order to fuel his mad quest for power. Though Stephenson is a skeptic, he can’t take the chance: he assigns young Ian Fleming (Alan Tudyk) as an attache to the magician, charlatan, and generally filthy old man Aleister Crowley (Stephen Rea), who’s been given the task for thwarting Hitler’s arcane ambitions. EMT-in-training Linus Wilkins (Paul Rudd) is attacked and bitten by a man he’s trying to rescue. Within days he dies, and within a few MORE days he comes back to life as a zombie. 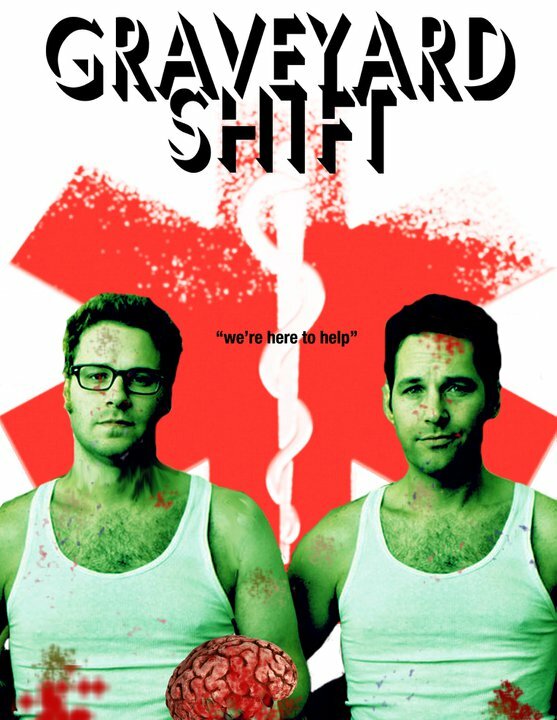 He ends up on the graveyard shift of the ambulance core with the also recently-deceased Hartford Donovan (Seth Rogen). Together, they explore the strange and often hilarious supernatural underside ofChicago– a place filled with hemophiliac vampires, drug-dealing leprechauns, and werewolf body-builders. Sponsored by IBM and Cisco Systems, The Fixers is a reality show in which a team of engineers are sent around the country – to struggling businesses, stumbling local governments, and hard-up not-for-profits – and then, applying their extensive knowledge of Science! rebuilds them into cutting-edge, state-of-the-art, technologically-advanced institutions ready for the 21st century. In other news, I may rewrite Quirk to actually be a high-school mystery-drama, like Veronica Mars. I want to watch Intrepid so badly, I could cry! And graveyard shift sounds amazingpants, but only if the zombification does not distract from the pretty of Paul Rudd. Not that anything could. Duh. Yes to Quirk. Only if you go the Veronica Mars route, try not to make it ‘cute white girl does something stupid and gets in trouble over her head.’ Brick was a nice take on high school detective stories, but a bit to stylistic for repeated adventures. Also, it’s Philadelphia, isn’t there a legion of high school graduates who are working piecemeal jobs before/while going to university? I mean, who are all those people who work retail anyways?